Last week I had my hands on the gorgeous handspun wool bands from the weavers of Cochabamba. 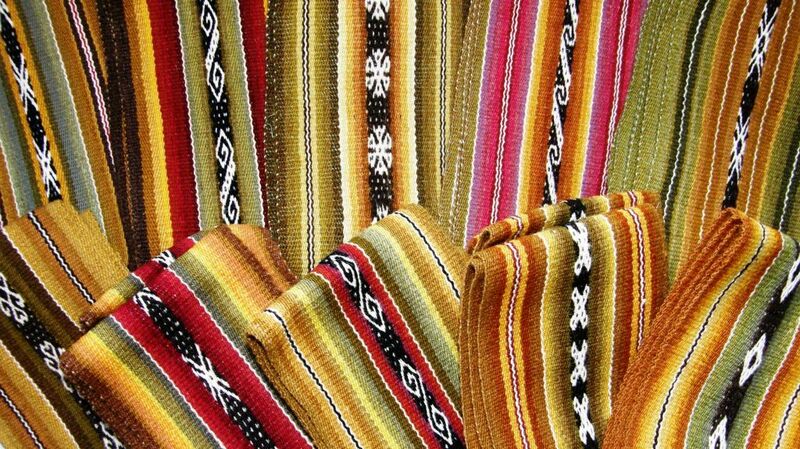 I was enjoying all the beautiful warm tones the weavers had obtained from dyeing with leaves, flowers and cochineal. I admired the different textures in the cloth that the tight twist in the yarn had created. 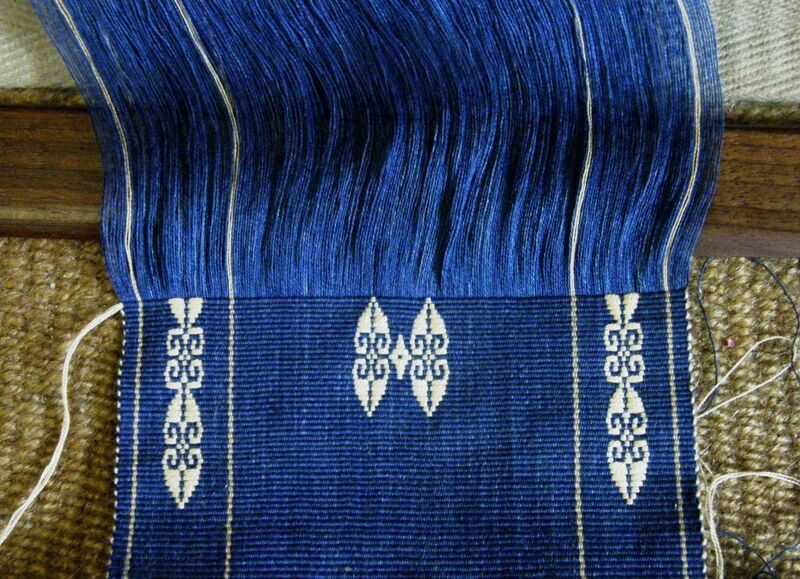 This week, I moved to the fresh, cool, blue of indigo-dyed fine cotton from Guatemala…. The variation in tone in the thread gives my woven fabric a lovely ‘rustic’ streaked look, almost like faded blue jeans. This is to be the cover for a journal that I bought to give as a gift for a friend. Her initials will sit on the spine of the book. 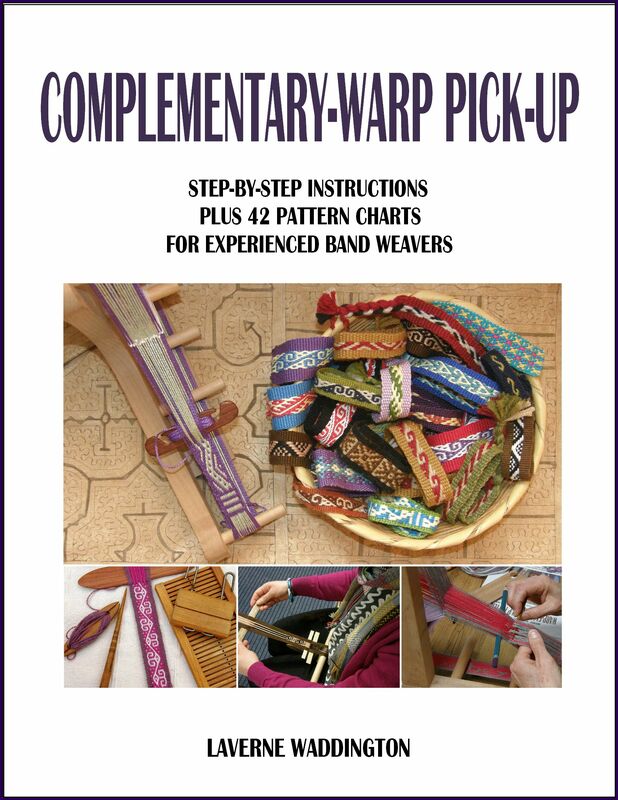 I enjoy doing the pick-up for supplementary-weft inlay especially when using fine thread and I love weaving the warp-faced plain- weave base for the patterning. The back cover will not have patterns and will be very fast to weave. Doing plain weave with such lovely thread and in such a gorgeous color is a joy. I am using a coil rod as part of my set-up to prevent corrugation. You can see the thin coil rod in the picture beyond the cross sticks. Getting the width exactly right was the challenge and I was happy to have used the Guatemalan cotton in the Key Fob Weave-Along that we ran in the Backstrap Weaving Group on Ravelry recently. 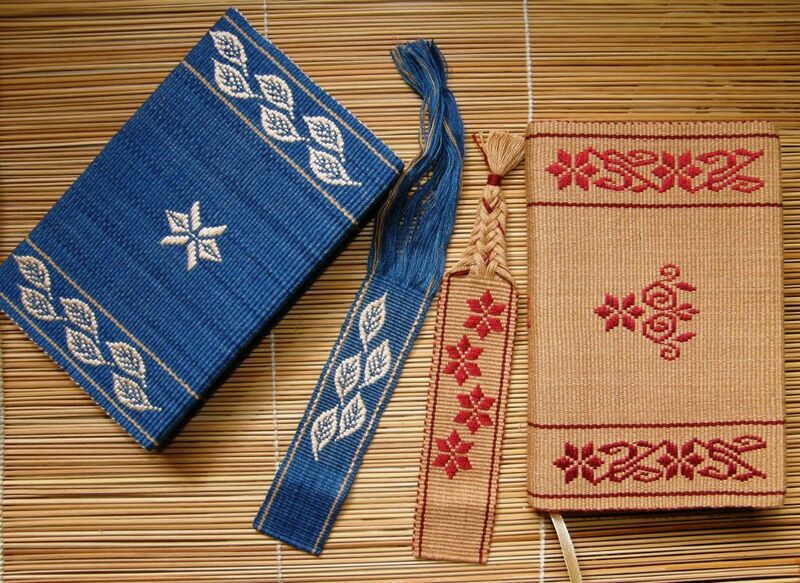 The blue and wheat-colored fobs gave me samples from which to make my width calculations. I normally wouldn’t completely trust information from such tiny samples but I was lucky this time and the book covers turned out to be the perfect width. I may even turn the key fob samples into matching book marks for these small journals. The covers are simply sitting on the books for the time being. The ends of the cloth have been turned to the inside and I will glue them there and then cover the inside with some pretty paper or card. I may have to also apply a line of glue next to the spine where the book cover bends to open. Tomorrow I shall go shopping for paper and more books because I am having a lot of fun making these. The center red motif below the flower head is an adaptation of a pattern that an online friend in Greece wove and showed me. It is fun charting the tiny initials to fit on the small space on the spine. 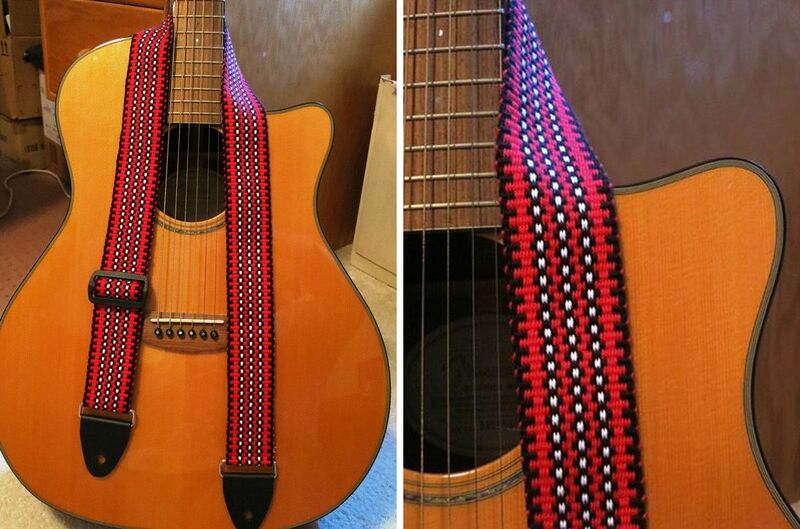 Here is a third one on the loom…. 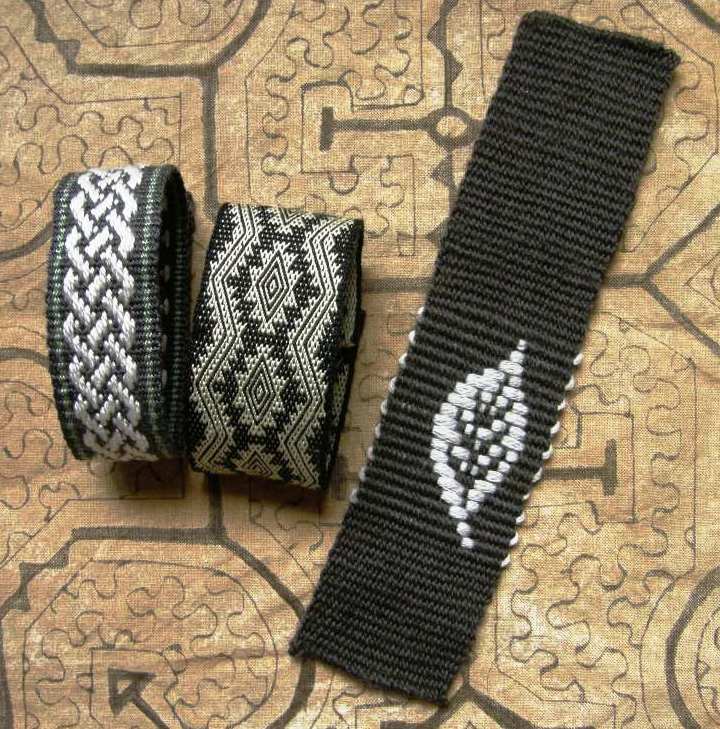 Apart from that, I got caught up a little in the recent interest in woven cuffs that emerged from the Key Fob WAL. It seems like a good natural progression…projects of similar length and just a little wider an lots of room for creativity with different kinds of finishes and closures. 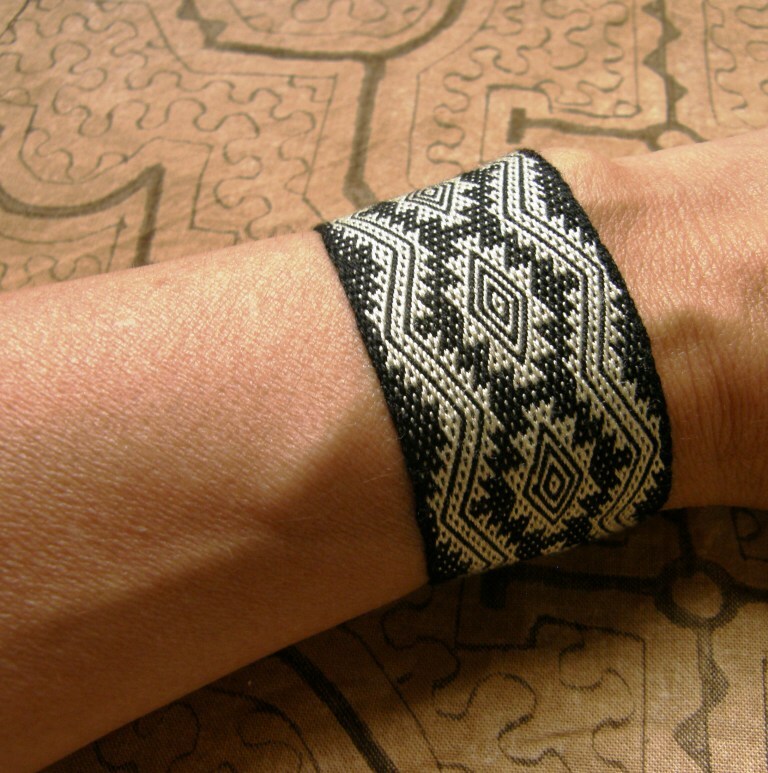 I made the silk Andean Pebble Weave band that I wove recently into a cuff. 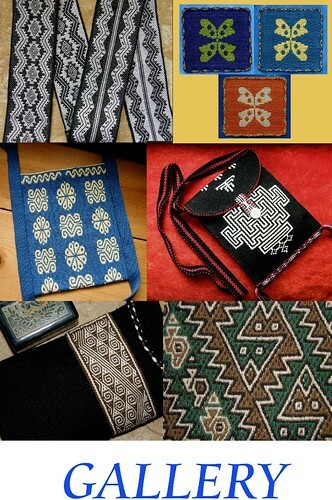 Some people like to make the closure of the cuff a prominent feature using a pretty button or other kind of clasp. I didn’t as my cuff is heavily patterned. I just overlapped the ends and secured them with press studs. The press studs, which are kind of ugly, get hidden under the overlapped ends. I used 60/2 silk which made a very fine band. This meant that turning and hemming the end did not create much bulk. One end has a selvedge and didn’t need hemming. Then I wove a cuff experiment in wool. I wanted to make a piece with four selvedges and see how much length would be lost to take up. I would like to make a fairly plain wool cuff with four selvedges so that I won’t have a raw edge with unwoven warp-ends to have to deal with….just a fairly plain band with a large button and maybe a tubular edging for decoration. I warped a band of 7 1/2 inches and only lost 1/2 inch in take up. I couldn’t resist throwing in a little motif along the way just for fun. So, this finished band gives me the information about take-up that I will need for planning the next one. I will most likely make the celtic knot band, on the left, which has just been sitting around here for ages, into a wristlet too. 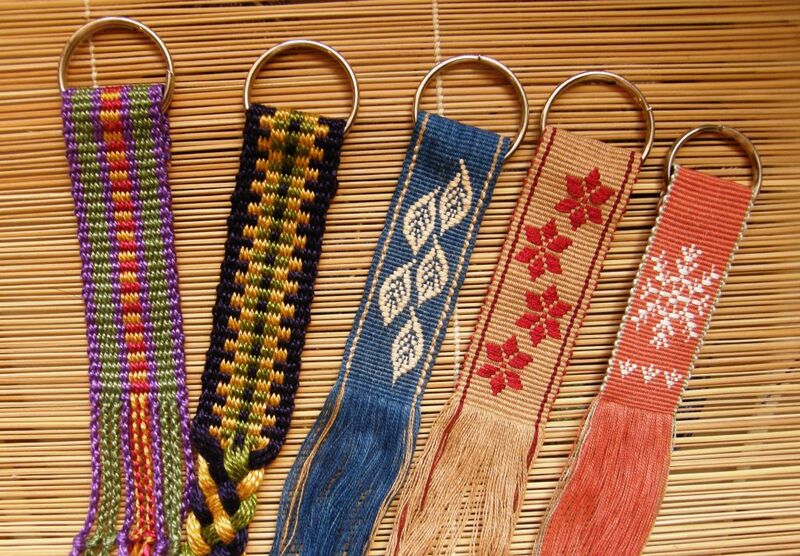 Now we are into March and the Key Fob Weave-Along is coming to its end. 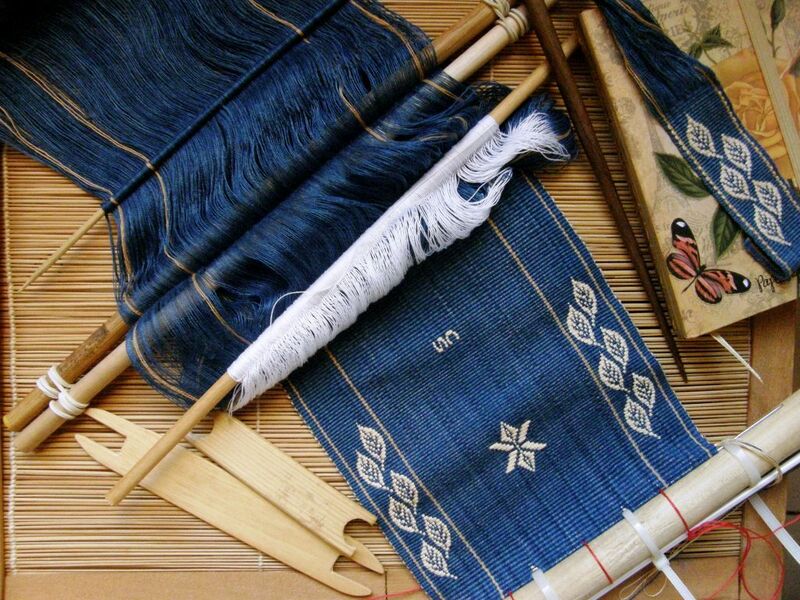 People are moving on to other projects and other looms or picking up backstrap things that they had put aside when the WAL began. 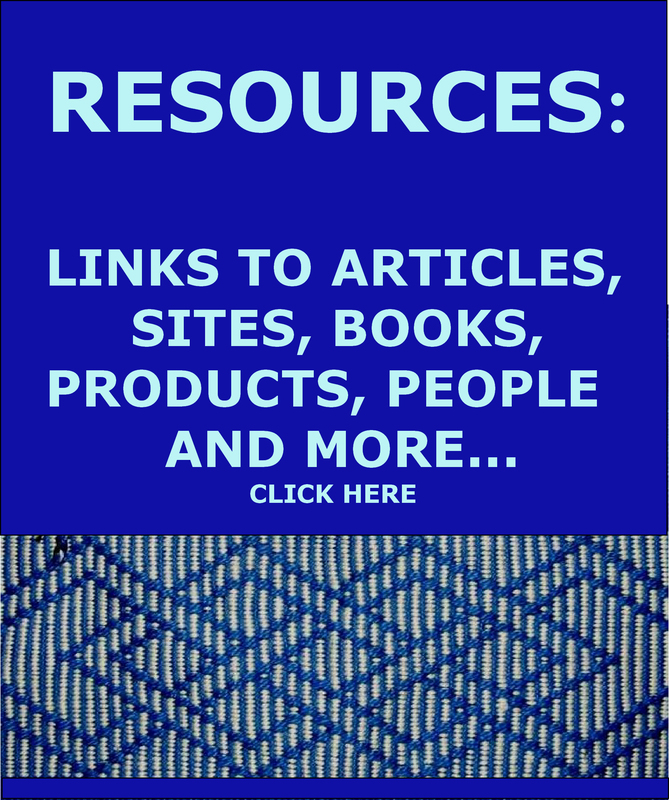 If you are wondering about the leather ends and buckles that she used, check out the ad for ASpinnerWeaver on the side bar of my blog or on the RESOURCES page. 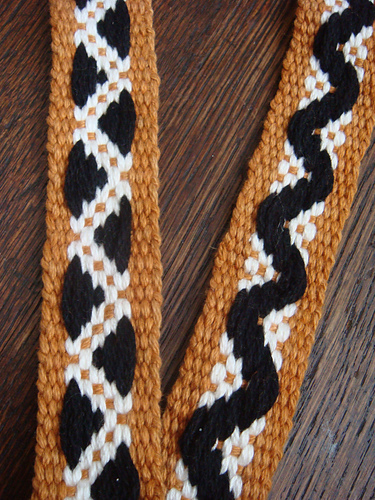 My friend Annie’s husband makes them in black and brown. Another exciting thing that came out of the WAL is fresh interest in the supplemental-warp structure which has had us looking, thanks to Catharina, at patterns of Estonia and northern Europe. 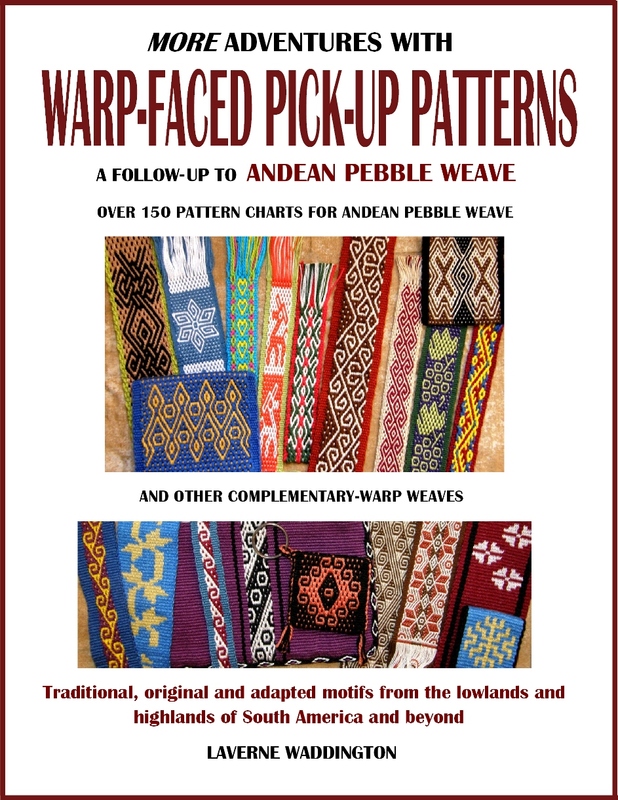 We have also been comparing the techniques of the supplemental-warp patterning that I was taught in Peru and Bolivia with those that I learned in highland Ecuador. The timing couldn’t be more perfect as I have just begun corresponding with a lady in Canada who contacted me via Facebook. She went to Colombia a year ago and has been sharing information about the suppementary-warp structure and how it is used there. I will try to gather everything and write about all that next week. All those lovely photos are candy for the eyes. 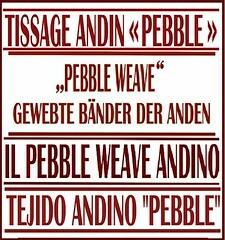 I have always enjoyed supplementary weft and like how it looks. Your leaves are wonderful. Do you have a chart for the posted? I gave them a try using one of your photos, but they just didn’t come out right. As always, thanks for your inspiration!